Minor culinary confession time: I had never had real ramen before. One of those food blind spots that I figured I would eventually correct given the right context. Truth to known, giving my lack of knowledge regarding ramen, I was never quite sure what to look for in good ramen or where even to find good ramen here in Montreal. Well, Chef Junichi Ikematsu, owner of JUNI on Laurier, solved that part for me with the opening of a Ramen Bar in the Plateau, Saka-Ba!. Taking advantage of some vacation time, I went down on a Sunday night with a couple of friends to finally try out some Ramen. 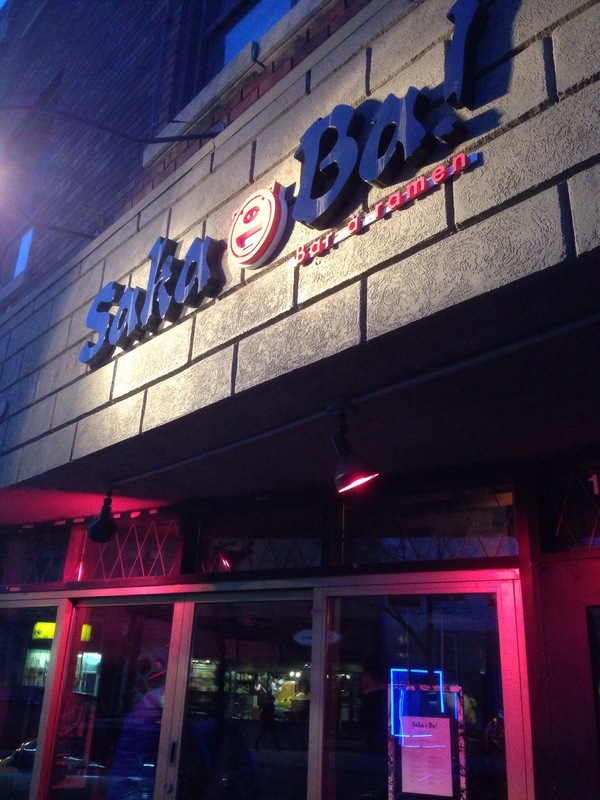 Located on Mont-Royal east of Christophe Colomb, Saka-Ba! is a sight to behold when you walk in. Modern in look but still very welcoming – nice touches of Japanese culture (art prints, anime strips on the walls) amongst the wood floors, grey walls and bright red tabletops. The focus of the space is the massive red wrap-around bar which really makes an impression. The kitchen in the back is visible to all so you can see the craziness happening as you wait for your food. Saka-Ba doesn’t take reservations so depending on when you go, you may end up waiting. We were there for 8pm on a Sunday night and still needed to wait 30 minutes so please take that into consideration. 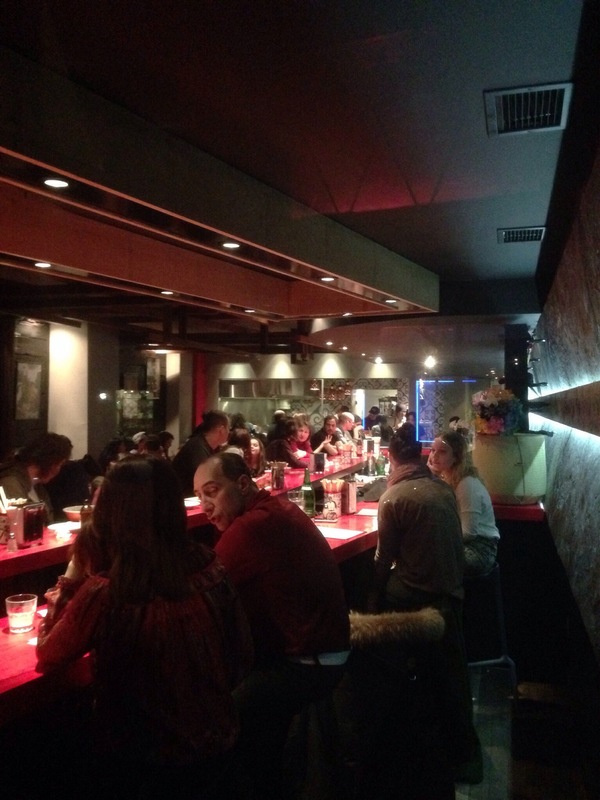 Food-wise, the menu consists of 3 types of Ramen with a variety of Izakaya or Japanese pub dishes available as well. As we were 3 pretty hungry guys on this visit, we attacked the menu with fervour and eat almost everything available. 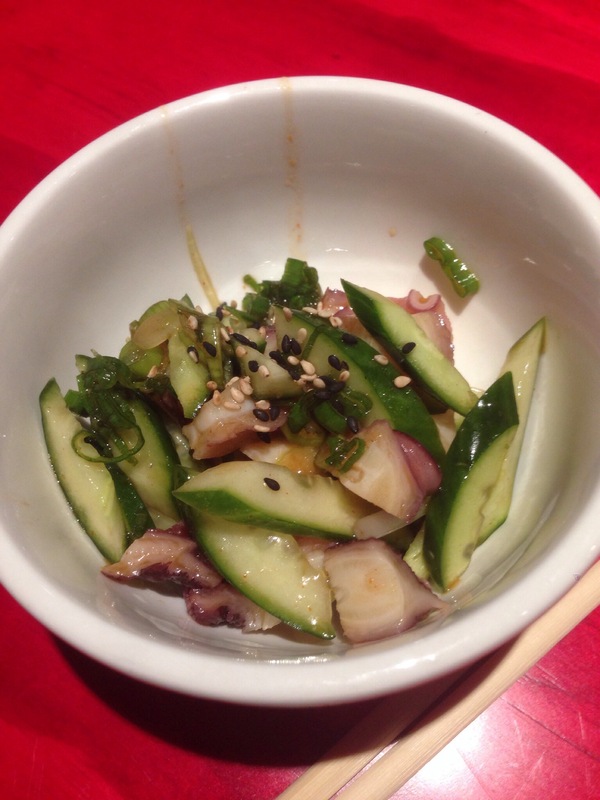 First up, Tako kiuri – an octopus salad with a spicy sauce. Deliciously tender octopus tossed with some cucumber, green onions, sesame seeds and a little sauce – a very nice starting point. The killer here was the octopus – texturally perfect without any of the chewiness one fears with poorly prepared octopus. Next up, Kimchi daikon. Kimchi, for the un-initiated, is a fermented vegetable dish using a combination of spices which typically create a very strong and spicy flavour. In this case, the vegetable in question was daikon. 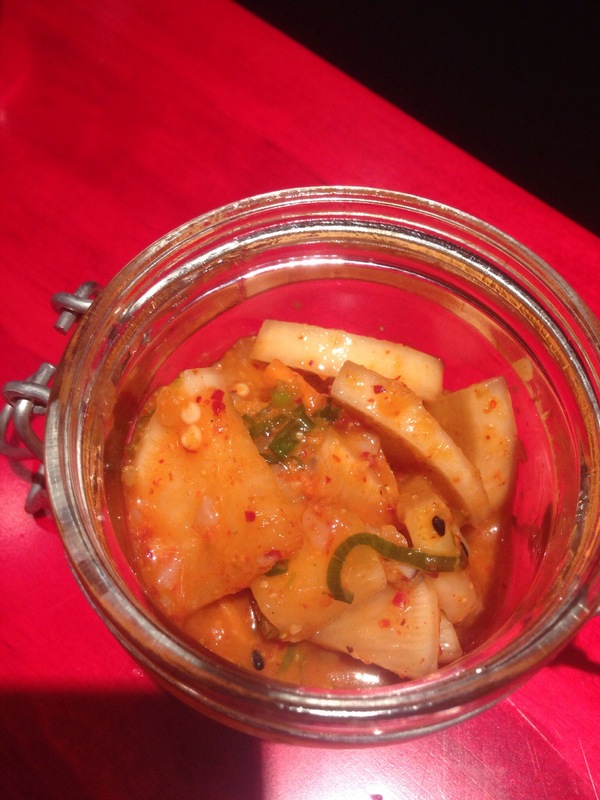 Served in a tiny preserves jar, Saka-Ba!’s kimchi started off softly but packed a strong punch at the end. 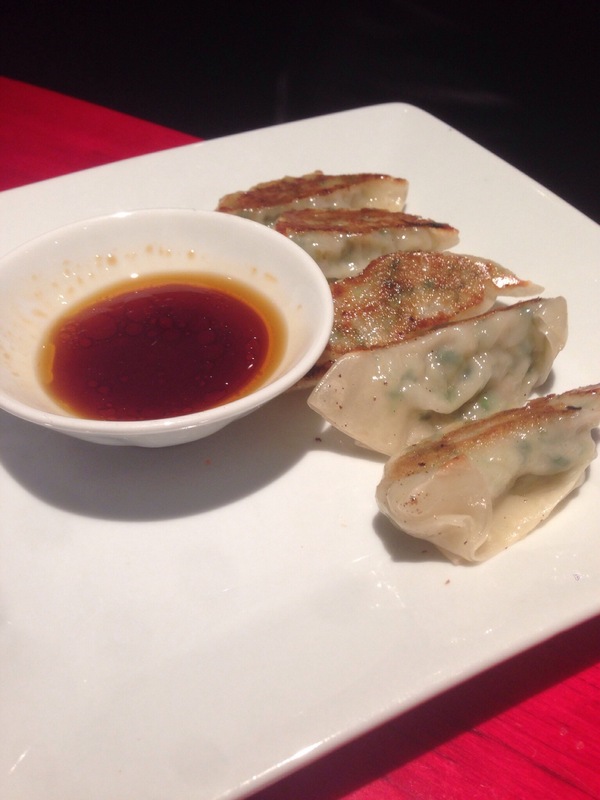 The third dish was the Gyoza – fried pork and cabbage dumplings. Big fan of these through my multiple Izakaya visits so these weren’t hard to enjoy on my end. Nice sear on the dumplings and the filling was quite flavourful – there really wasn’t much need for the dipping sauce in my opinion. 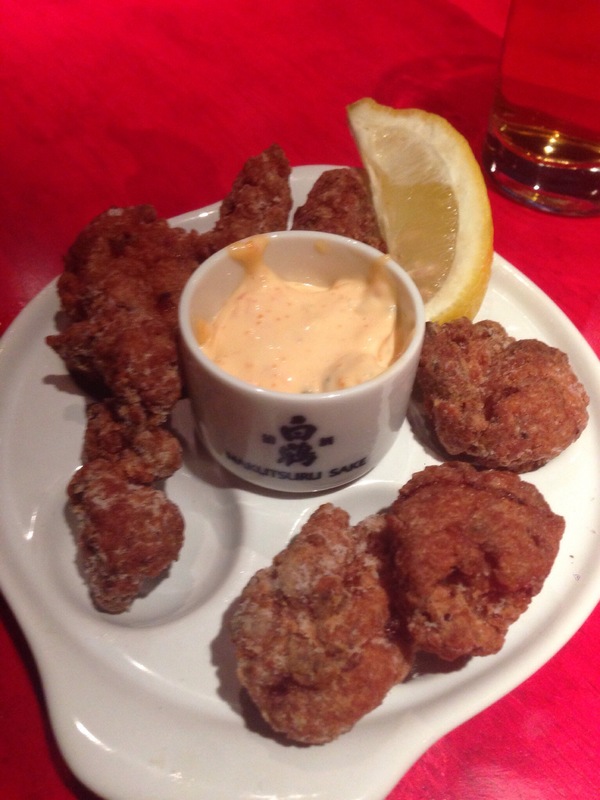 Next, we had the Kara Age – fried organic chicken with spicy mayo. Probably the best of our starters – great crunch to the chicken while still remaining juicy and tender. The spicy mayo was also on point – even though we ran out of chicken, we finished off the sauce regardless! 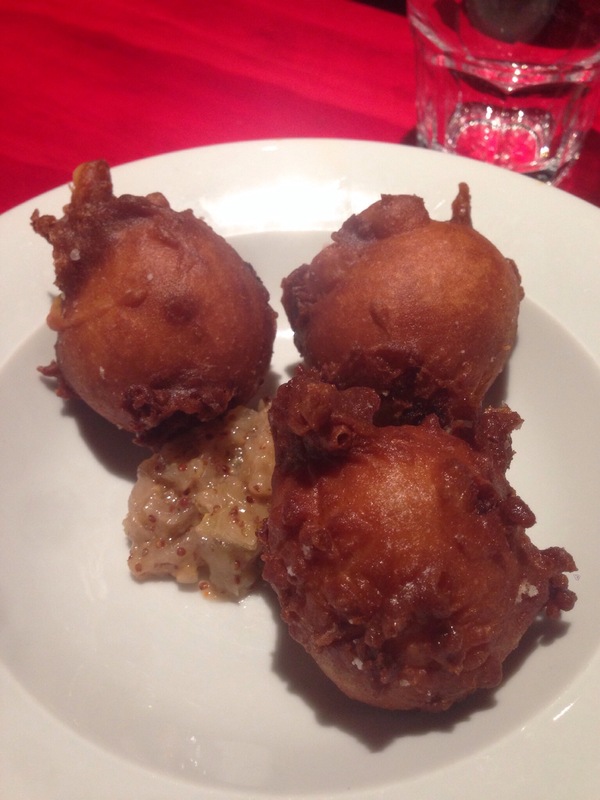 To follow the path of fried food, we also had the Corn cari – curry stuffed doughnuts. Probably the most disappointing dish sadly – the fried balls themselves were great however the curry mixture inside lacked much punch. It really didn’t add anything to the dish and left all 3 of us wanting. The final starter (yeah I know…. 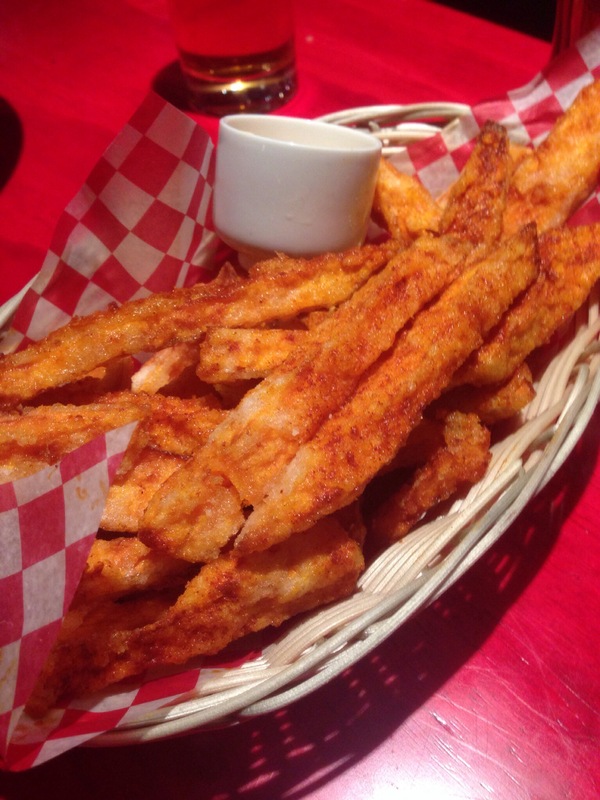 what can I say, we were hungry) was the Satsuma Age – sweet potato fries. Served with more of that great spicy mayo and lightly tossed with some paprika, these thickly cut fries were delicious and not over breaded either which was appreciated. And now we reach the main course – the Ramen. Saka-Ba! 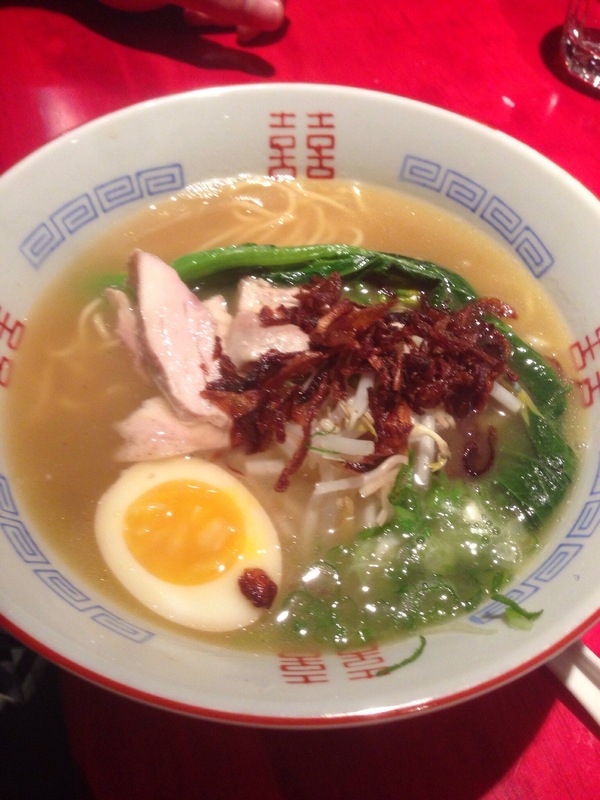 offers 3 types of broth each with their own extra ingredients to mix with the house made noodles and the boiled egg. First up, the Shoyu Ramen – pork and soy broth, braised pork, bean sprouts, bamboo and green onions. As a first experience with Ramen, this one struck me as a very good one. The broth was rich and flavourful – huge pork notes within the broth. The noodles were awesome – great texture with their own nice taste. The braised pork simply fell apart – so good. The egg added some rich creaminess to the mix and the rest of the ingredients provided some nice notes to the mixture. 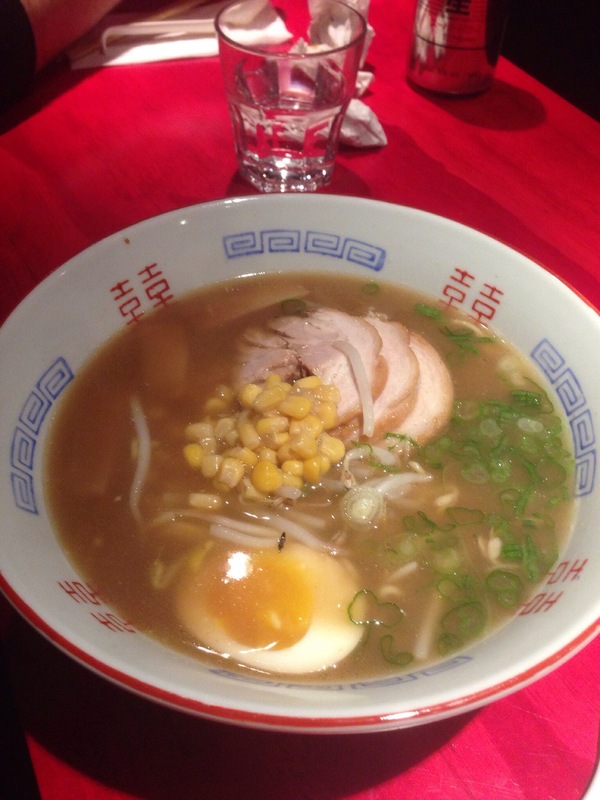 A great intro to Ramen for yours truly. The second variety was the Ebi Miso Ramen – Lobster and pork broth, miso, braised pork, corn, bean sprouts, bamboo and green onions. The addition of lobster in the broth and the miso brought forth a slightly less pork flavoured broth with not much of a lobster taste to be honest. The rest was as great as the first bowl. The final variety was the Tori shio Ramen – chicken and salt broth, pain seared upper leg chicken, fried onions, bean sprouts and green onions. This was a very different profile than the other two due to the lack of pork and the use of chicken. The chicken meat itself was nice and tender and the fried onion brought some crunch. The broth here was quite a bit saltier than the previous two – more noticeable for the two of us who primarily ate the other two than for the one who ordered this bowl but still. Of the three, I would likely stick to the 1st one but each had their strong point. 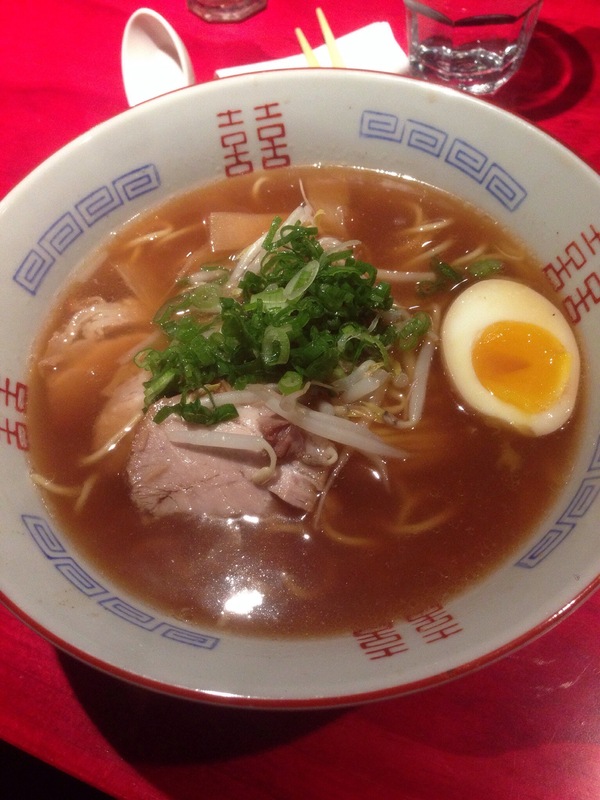 As an introduction to Ramen, Saka-Ba! 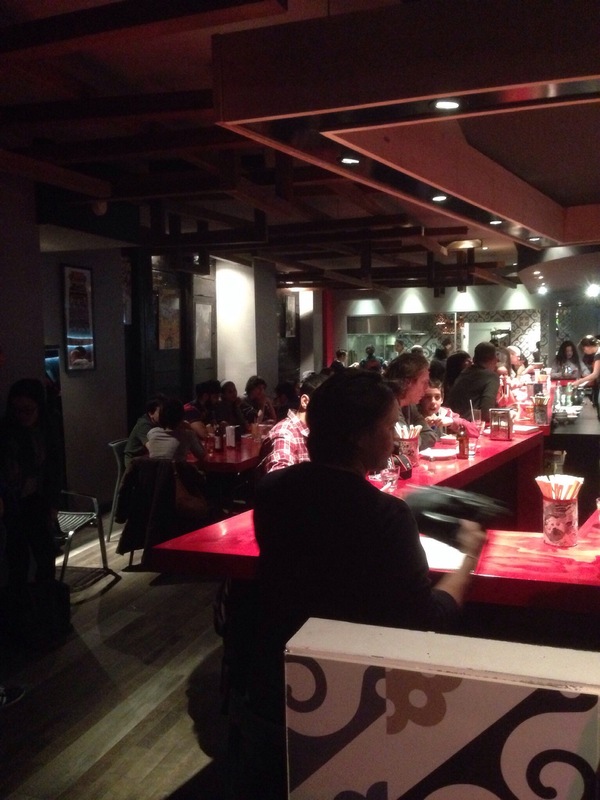 hit all the right notes – great decor, nice vibe and awesome food. As someone who hates waiting in-line for any meal (still the biggest reason why I don’t return to Kazu), I am not sure I would do so again for Ramen but Saka-Ba! certainly made a great impression on me. As a starting point for Ramen, I definitely feel I got the proper experience to judge future bowls. I’m sure you will as well.